Euclid is one of the greatest mathematician of all time. His greatest achievement was writing the Elements which contains many theorems and propositions collected by Euclid, and many of which he supposedly proved. What is great about Euclid’s work was that he developed the Elements in an axiomatic way, a feat that was never before done in his time. Euclid started the Elements by writing some definitions, common notions, and the five postulates. From these building blocks, he build on constructions and theorems on top of the other. This is known as Euclidean geometry. To this day, Euclid’s work is still used in high school mathematics. The first proposition of Euclid involves construction of an equilateral triangle given a line segment. Before we discuss this construction, we are going to use the posulates, defintions, and common notions. Euclid created 23 definitions, and 5 common notions, to support the 5 postulates. The first proposition involved the construction of an equilateral triangle using a compass and a straightedge given a straight line segment. To do this, we can do the following steps. 1.) Using a compass, make a circle with center A passing through B. This construction is justified by postulate 3. Postulate 3 states that given any straight line segment, a circle can be drawn having the segment as radius and one endpoint as center. 2.) Construct a circle passing through B. Again this is justified by Postulate 3. 3.) 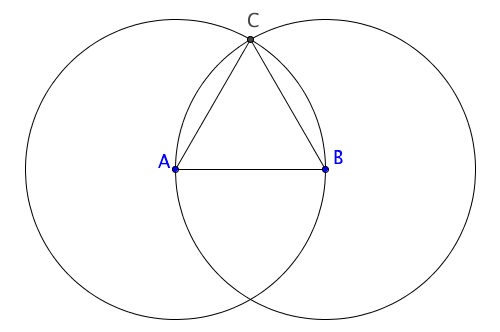 Determine the intersection of point A and B. Justified by definition of a point. 4.) Construct segments AB, AC, and BC. This is justified by Postulate 1 which states that a straight line segment can be drawn joining any two points. After this construction, we have now constructed an equilateral triangle. However, we still need to prove this. Euclid lived 300 BC but his work an axiomatizing Geometry was way way too head of his time. More than 2000 years later, a debate sparked whether the 5th postulate is really a theorem (can be derived from the definitions, common notions, and 4 postulates). Several hundred years later, there was doubt whether the 5th postulate can be proven (and hence not an axiom). This problem was never solved for hundreds of years until it was finally solved by Eugenio Beltrami in 1868. The 5th postulate cannot be proven. Euclid was right after all.